I have been obsessed with frozen pina coladas in recent months, which in turn, has led me on the search for other coconutty deliciousness. I was searching the Food Network website and found an Ina Garten recipe that I played around with to make the best cupcake I have ever tasted! Yes, people, I said the BEST! These cupcakes are amazing! Send your hubby, boyfriend, child, wife, partner or whoever to the store and make these babies tonight! added an additional 2 cups of powdered sugar to the frosting, I did this because the frosting was too thin and I wanted to pipe it on the cupcakes using the Wilton #32 Star Tip. I toasted the coconut in a 330°F oven; watching constantly and stirring often. Hit up The Food Network site for the recipe …AND then go make it! Oh, the website says that this recipe is only available for a limited time, so make sure you print this one out. Trust me, you’ll want this in the future! They look (and sound) great… but then again, your pics ALWAYS look great! I love Pina Coladas and used this recipe a while back for mini cupcakes. I swapped rum extract for the almond. They were delicious. Oh wow, these sound like a coconut dream! Loads of flavour. I think your alterations sound just perfect! :) Love your pic too, very nice! 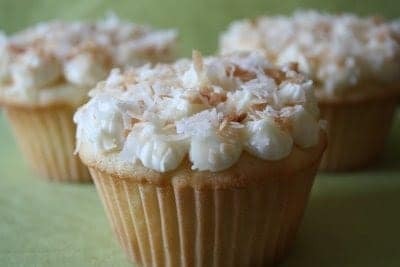 Coconut cupcakes are a real treat! yours look fabulous! These look so, so good. Did you fill the paper cups to the top with batter like the recipe said? Hi there…I’m new to your baking blog and am very excited to try this recipe. I found you off of tastespotting.com. And, the wannabe photography stuff…what are you thinking? Your photos look professional! Wannabe, schmannabe! I made these for my wife for Valentine’s Day. She loved the frosting. The cupcake was good once it cooled. When it was warm it had an eggy smell. Thanks a lot. Hi there. I’m thinking of making these cupcakes for a friend’s birthday. She really loves coconut cake and I am looking for something moist and flavorful, and definitely coconut-y. I know you made these nearly 2 years ago, but would you still recommend them after all the other cupcakes you’ve made since?? I made these last night and they are absolutely the most amazing cupcakes I have ever eaten. Thanks for the recipe. I will definatey be making these again. I came across Ina’s recipe a couple of months ago and made the same alterations. In addition, I swaped out the regular milk and replaced it with coconut milk (sometimes hard to find in major grocery store chains but should be available at Whole Foods and Trader Joes). I think this extra alteration is definitely worth while. I’ve only made the coconut cake but I’m so excited about making the cupcake version. Thanks so much for sharing! I just made this with a couple of the women from my church. OMG!!! they are so good!!!! I put a dried pineapple on top for the garnish as well as the toasted coconut to make it look more like a pina colda cupcake. These are wonderful a little time consuming but so worth the wait and so wonderful!!! I came across this website 2 days ago its awesome! !